Gaëtan Bulourde, born in France, lives and works in Bruxelles. After mathematics studies he played bass guitar in various rock bands until he developed interest for fine arts and dance. 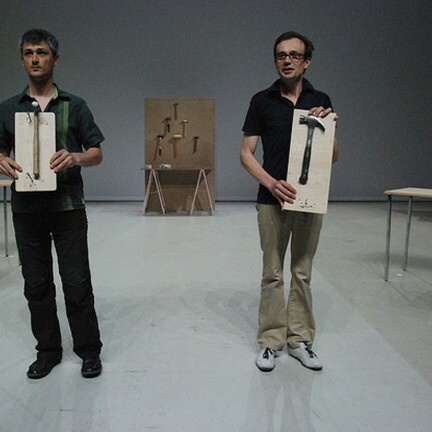 Since 1998 he developed projects between dance, theater and performances like the solos Pfuuf ou le bout de la langue (2004) and TV News Hasselt (2006), besides collaborative projects as Already Made (2010) with Valérie Castan and Werner Hirsch, and Not every object used to nail is a hammer (2008) with Olivier Toulemonde. As a dancer/performer he has collaborated in different productions with Meg Stuart, Xavier Le Roy, Marco Berrettini, Martine Pisani, Thomas Lehmen, Christian Rizzo, among others. As a musician he developed a bass and guitar solo, Bionik, and participated at Sleaze Art, a 7 electrics basses and guitars band around the composer Kasper Toeplitz. Olivier Toulemonde lives and works in Berlin. In 1993 he was a co-founder of Collectif Ishtar and joined the Collectif et Compagnie. He plays improvised music with acoustic objects or amplified springs. He works on listening, sound research and the relationship between sound and space. Besides Bulourde, he has collaborated with Nicolas Desmarchelier, Michel Doneda, Christine Sehnaoui, Mathias Forge, Agnes Palier, Jack Wright. His latest works are The Sound Metallurgy Trade Union with Arnaud Paquotte (2009), Seismograph (2008), Empty Factory (2008), furthermore the radiophonic piece Mosquito (2009). Toulemonde has been also responsible for around fifteen soundtracks for Muriel Toulemonde’s video works, which have been exhibited internationally. His latest release was 2010 Crickxstraat (with Agnès Palier / FFHHH records).